I was born into a devoutly religious home. My family went to an Episcopal church. I learned very early in my life the rites and rituals of the church. It was not something that I questioned. As a child I accepted what I was taught and was told was right and proper to believe. I acted in church Christmas pageants, learned the songs, said my prayers. I "accepted" Jesus as my savior at the age of three and was baptised at the age of four. My education was in private, church based christian schools. Every subject was taught with a christian perspective. And with the unquestioning faith of a child I believed every word. At the same time, in the schools, I was constantly picked on and bullied by other kids who professed to hold the same faith. It didn't make sense to me. But I continued to believe. At the beginning of my 8th grade year, around 1990, my family left the Episcopal church and began attending a non-denominational, charismatic protestant church. It was there that I learned about such doctrines as the baptism of the holy spirit and speaking in tongues. The importance of these things was such that I began to feel that somehow I was less spiritual than those around me because I couldn't speak in tongues. I began to wonder what was wrong with me. I was told to pray and ask god to fill me with the spirit and that he would. So I prayed and prayed, yet nothing happened. Then in 2001, we left that church and went to yet another church. This church was even more charismatic. It was normal at any given time during a service to see people raising their hands or hear the pastor suddenly start speaking in tongues in the middle of a sermon. And yet I still couldn't do it. So, in order to fit in, I began to fake it. The speaking in tongues, while I was assured it was a holy language that only god could understand, sounded suspiciously like nonsensical babble to me. And as I faked it, people around me began to give thanks to god that I had been filled. I continued faking it until I began to believe that I was really doing it. I had fooled myself into thinking I really had been given a "prayer language" by god. I don't recall the exact cause but suddenly I began to feel like something was wrong. I began to feel like a fraud. For years I had believed. For years I had accepted. But suddenly I felt empty and alone. I felt like everything that I had lived and believed for years had been a scam. And I realized suddenly that I didn't really believe any of it and hadn't for years. I realized that I had been quietly going along with it all to keep the peace with my family. It was then that I decided I needed to figure out what I really believe and what worked for me. I have become a person who is skeptical. When I am told something is true I seek proof. I see no proof of the existence of god.I began studying and investigating various different belief systems. I read everything I could get my hands on. I began exploring various different pagan paths before I finally settled on Norse heathenism. I declared myself a follower of the god Thor. And for a time, this seemed to be a good fit for me. But eventually, even that began to lose its shine and seem like I was wearing a garment that was the wrong size. From there I began studying Buddhism. I will say that some of the teachings of Buddhism helped me a great deal in terms of learning how to control my anger. It helped me to learn how to control my temper and not let things bother me as much as they had. Despite the good things I learned from my study of Buddhism, I could no more be a Buddhist than I could a Christian or a pagan. So I declared myself an agnostic. I decided there was probably some sort of divine supreme being but there was no way I, a mere human, could comprehend what it was. I began studying in more depth many different religions and philosophies an picking what I liked from them and discarding the rest. I began what I termed a "Seeker of truth". I began to realize I was finding more things that I liked in philosophy rather than religion. There was very little that I truly liked or accepted from the religions that I studied. Ultimately, I picked up Richard Dawkins' book "The God Delusion". The more of it I read the more it made sense. I realized that all the things I had been taught in school that were "God's handiwork" in reality had a scientific explanation. I began reading more about evolution and decided it made infinitely more sense as an explanation of all the things I saw in the natural world than the biblical account of creation. One evening, while having a philosophical conversation with my wife and expounding on my views she looked at me and said, "You're not an agnostic. You're an atheist." She didn't say this as an accusation. Rather, she just stated it as a matter of fact. Her comment made me stop and think. I looked back over my life and the course it had taken. I reviewed my views and opinions. Finally, I realized, she was right. I'm not a Christian. I'm not a pagan. I'm not a Buddhist. I'm not an agnostic or any of the other paths that I tried out in my search. I am an atheist. From there I began to investigate and see if I could track down exactly when and why I became an atheist. I know there are many reason that people eventually come to atheism. I also know that being an atheist is not for everyone. I'm not going to descend into a diatribe about the supposed inherent weakness of those who identify as followers of a particular religion or spiritual path. Frankly, I don't believe that people who follow a system of religious belief are any stronger or weaker than those who choose not to believe. Rather, I have very specific reasons for being an atheist. I hope, herein, to explain those reasons. For many centuries, even before Christianity, religion was used as a tool to control and dominate the masses. It led to strife, disagreements, war and killing. Today many people point to radical Muslim terrorists as an example of religious fanaticism out of control. However, this is not something new. The crusades and the inquisition were examples of Christianity at it's fanatical, out of control worst. Today we are bombarded by media stories of Christian groups discriminating against various segments of the population, most notably the LGBT community. While I am not a member of this community I have friends who are and I consider myself one of their straight allies. It grieves me to see anyone discriminated against for any reason by a community that is supposed to embody love as a virtue. I suppose it could be said that I have an idealistic view of what the future could be. My view is informed by my love of Star Trek. In Star Trek I see a society that has moved beyond religion. Nowhere is seen the divisions caused by religion. Rather, we see a society that has evolved beyond the arguments and fighting over which god is superior or which is the "right" faith. What we see is a society that works together for the overall good of all members of the society regardless of ethnicity, gender or sexual orientation. In this society "sin" is a foreign concept. In this society the idea of discriminating against someone for any reason is unthinkable. It is also a society in which cooperation abounds and leads to greater understanding and discovery. It is a society in which I would want to live. I will not argue that it is a perfect society as there is no such thing. There is still strife and disagreement among people. But people being what they are such things will always exist. However, that strife and disagreement is not on the grand scale that religion seems to engender. I have become a person who is skeptical. When I am told something is true I seek proof. I see no proof of the existence of god. There are many who would support the idea of creation or intelligent design as such a proof. The great body of scientific evidence does not support these claims. Science leans more toward supporting evolution and natural selection instead of creation or intelligent design. It is in the face of scientific evidence that I must conclude that the universe and all that dwells within it was the result of the big bang and subsequent evolution rather than the act of an intelligent divine creator. Ultimately, after a long time of seeking and studying, I have arrived at atheism. There are many who would mourn the death of my faith in a god. There are also those who would quote the Christian bible which says "A fool hath said in his heart there is no god." There are also many who would say to me that they will "pray" for me. If that is what they choose to believe or to say, that is their concern not mine. Just as what I choose to believe or not believe is my concern and not theirs. I only ask that my right to choose what I do or do not believe be respected just as their right to choose what they believe is to be respected. 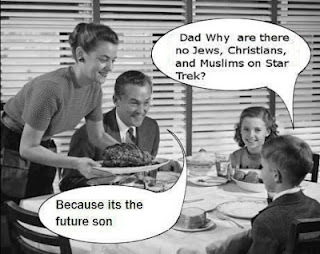 Looking forward to the future of our world I can only hope that the future shown in Star Trek is the future that awaits humanity.